Wondering what the current official name of SQL Anywhere is? ASA (Adaptive Server Anywhere)? iAnywhere? SQL Anywhere? Watcom SQL? Was there a version 14 or 15? Version 13 and 14 were skipped for cultural reasons (13 is bad luck in US and 14 in China). 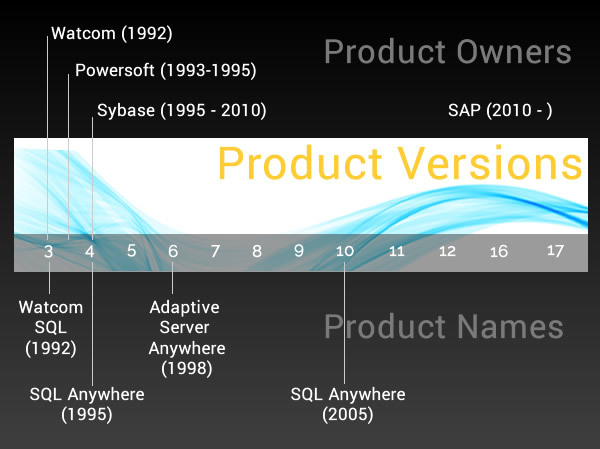 Fifteen was also dropped because Sybase wanted to align several product versions with 16, so SQL Anywhere directly jumped from 12 to 16. 2016: "Standard" and "Workgroup" disappeared. Per CPU licenses replaced by Core.